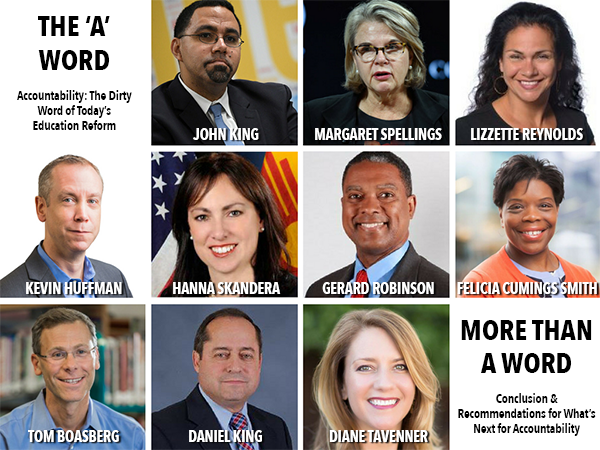 A little over a year ago, we released The ‘A’ Word series to hear directly from education leaders who are charged with implementing accountability policies every day. A group of 11 national, state, and district leaders described why accountability is an important tool to improve outcomes for the students and families they serve. What was clear then, and remains clear today, is that state leaders have the most potential to create educational opportunity for young people. Debates around the purpose of education continue at every level. But federal policy continues to defer the creation and implementation of standards and accountability measures to the states, and Every Student Succeeds Act plans have now moved from document to action. Are our kids on track? On track for what? And how do we know? Somewhere and somehow, accountability became a quasi-intervention instead of a descriptive or diagnostic tool. Accountability measures highlight what is working — or not — and for whom it is working — or not working. The measurement alone changes nothing. Our charge, as educators and leaders, is to use that information to deploy interventions that will make the system work for students and families. The field’s readiness to intervene is spotty; our students deserve more. This January, we add the perspectives of five state leaders to this important discussion. Tennessee has been an education state to watch for more than a decade, thanks in large part to the leadership of Governor Bill Haslam, who left office last week, and former state legislator Jamie Woodson, who recently stepped down as CEO of SCORE. 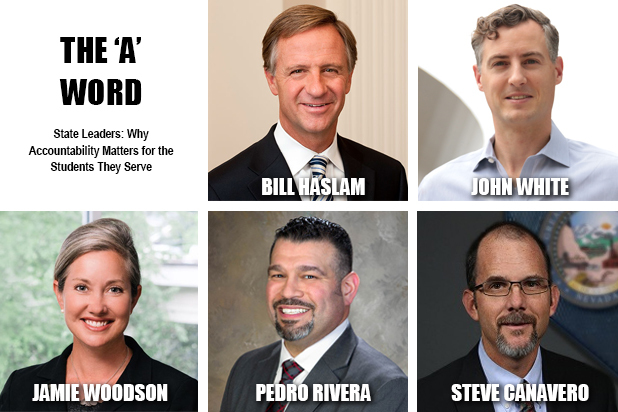 – Haslam describes the important impact of bipartisan leadership in Tennessee and shares how workforce needs drove new policy around access to postsecondary education. He also cautions us to be clear-eyed about America’s slipping global leadership in education. – Accountability’s purpose in Tennessee, Woodson explains, is to measure whether students receive a year of learning for a year in the classroom. She describes quality education as the best pathway for a young person to achieve economic independence and full participation in his or her community. A trio of state chiefs — Louisiana’s John White, Nevada’s Steve Canavero, and Pennsylvania’s Pedro Rivera — describe how accountability policy factors in the success of their respective state’s students. – White encourages us to think about the intersection of trust, accountability, and decentralized school systems. All system leaders can build coherence within their systems, reducing the chaos and increasing the trust, both of which allow adults to focus on improving outcomes for students. He acknowledges that work as being difficult but also possible and essential. – Canavero distinguishes between Big-A and Little-A accountability, describing the former as the summative judgment and consequences policy that often draws heated debate and the latter as the daily practice of adults committed to improving conditions for kids. He also flags the importance of district-level accountability for those making decisions about financial or human resources that directly impact principals and teachers. – Rivera describes accountability as the contract between educators, policy leaders, and communities around shared expectations. He details the importance of using accountability to highlight, and solve for, root causes of issues. A diagnosis without a plan is not an effective solution, whether at the doctor’s office or in the school district. Gaining a clear picture on student success in a state or city does not rest on a single data point, something the Bush Institute’s recently updated State of Our Cities tool demonstrates. The tool tracks a range of data, including academic outcomes, enrollment, teacher salaries, and per-student spending. While all of that matters to build a picture of a place, claiming to work on behalf of students without centering on student academic progress is the policy equivalent of a Potemkin village. Calibrating accountability policy and practice is difficult, but critical, as these five leaders describe. Simply put, students who are off track academically greatly reduce their chances for prosperous, self-determined lives. These five state leaders agree that getting this right sits at the core of America’s future — our economic freedom, our democratic freedom, and our leadership in a quickly changing world.